Max Carver's father - a watchmaker and inventor - decides to move his family to a small town on the coast, to an old house that once belonged to a prestigious surgeon, Dr Richard Fleischmann. But the house holds many secrets and stories of its own. Behind it is an overgrown garden full of statues surrounded by a metal fence topped with a six-pointed star. When he goes to investigate, Max finds that the statues seem to consist of a kind of circus troupe with the large statue of a clown at its centre. Max has the curious sensation that the statue is beckoning to him. As the family settles in they grow increasingly uneasy: they discover a box of old films belonging to the Fleischmanns; his sister has disturbing dreams and his other sister hears voices whispering to her from an old wardrobe. They also discover the wreck of a boat that sank many years ago in a terrible storm. Everyone on board perished except for one man - an engineer who built the lighthouse at the end of the beach. During the dive, Max sees something that leaves him cold - on the old mast floats a tattered flag with the symbol of the six-pointed star. As they learn more about the wreck, the chilling story of the Prince of the Mists begins to emerge. 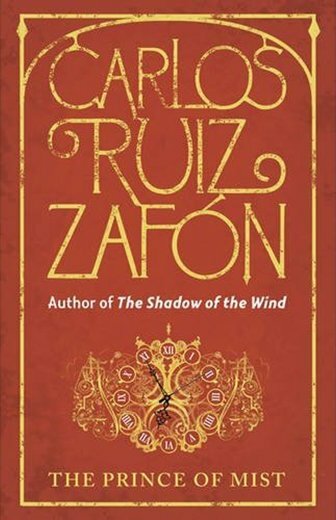 This is the first book that I've read by Carlos Ruiz Zafon and apparently the first book he wrote. I've heard people rave about The Shadow of the Wind, but I haven't gotten around to it as yet. I've heard it can be confusing? So I was a little worried when I started this one. I needn't have been. The Prince of Mist is quite straight-forward and entirely readable. Max and his family move from their home in the capital to a coastal town. It's the war and it's thought that they might be safer farther away. But once they arrive to this old, abandoned house, strange things start occuring. Dreams that seem to be focused on an overgrown garden nearby containing the statue of a circus troupe. At it's centre, a creepy clown which seems more than it appears to be. A cat jumping out wardrobes. Unsettling feelings that something is lurking about this house, waiting. Max learns that the house they are living in once belonged to a doctor with a small family. The doctor's son, Jacob died in a terrible drowning accident and the house has stood unlived in for many years. Max does, however, find film that was recorded by young Jacob before he died. When tragedy occurs, Max and his sister Alicia and the new friend they've made, Roland set out to solve this ghostly mystery and it takes them from a spooky old house to the town's lighthouse, even to a boat, shipwrecked in the bay. Piecing the clues together, Max and his friends come up with a very spooky tale. I'd describe The Prince of Mist as a gently unsettling story. I never felt in any grave peril, but I did feel rather creeped out at some of the descriptions and details of the story. Max and his sister Alicia seemed very likeable and I enjoyed the progression of their relationship from misunderstood brother and sister to that of a more firm relationship. Even Alicia's burgeoning relationship with Roland was rather cute, especially seeing it from Max's perspective - his rather uncomfortable 'where do I fit in and how will this change my relationship with my sister' feelings. It was sweet. The whole atmosphere of the book, from the old house to the creepy clown, to the sunken boat was sufficiently ghostly but not to an extent that it would frighten anyone too entirely. So while it didn't quite scare the pants off me, I also didn't want to put the book down. 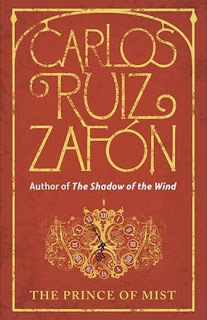 I think it's an excellent step into Carlos Ruiz Zafon's writing and it has made me a lot more curious about his other works and I do hope his other work for young adults will be published soon! This sounds really good! I read The Shadow of the Wind, which I enjoyed, and didn't find it confusing at all. Zara - I have The Shadow of the Wind, have done for ages and I just can't bring myself to pick it up. Something about it just puts me off. But this, I enjoyed.